Marilyn SanClemente February 23, 2016 February 23, 2016 Birthday, Handmade cards, Occasions catalog, Stamper's Club, Stampin' Up! 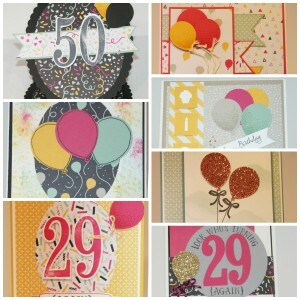 Don’t you just love all t he great new Birthday stamp sets in the Stampin’ Up! Occasions catalog? So the Stamping New England Design Team has designed a really nice set of Birthday Cards for the month. You do not want to miss out this month! This Tutorial includes full step-by-step instructions for 9 cards including a Pop-up Box Birthday card with a You Tube video. My tutorials include step-by-step instructions and you have lifetime access to the tutorial and the You Tube video!